Hi there little bits! Today I have the pleasure of filling in for Ms. Lovely, herself, who's currently playing jet setter in Europe. And what else would you have someone as fabulous as her do- sit home and crochet? No, no, Rachel is just where she belongs. 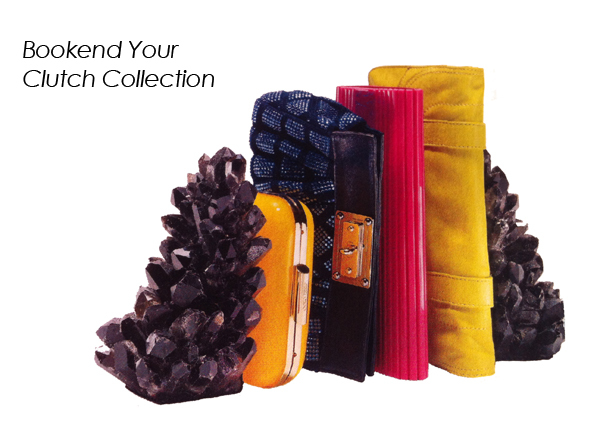 Speaking of: clutches, and where they belong. Beyond their practical function of holding your womanly secret weapons, clutches are also visually tantamount to a fabulous outfits. Like statement jewellery, a clutch may serve as the exclamation point to any wardrobe composition. And then there comes that issue: when not hoisted up in your under arm or pinched between dexterous fingers while you're out on the town, what in the hell do you do with them? Option 1. File your clutches away a la the magazine route. Magazine files are rather perfect for flattened handbags as they keep them in place and provide you with ample access. The photo below is a real winner because of the strategic placement of the mag files; clutches go in files, files serve as dividers for the smaller handbags in between. Genius. Option 2. 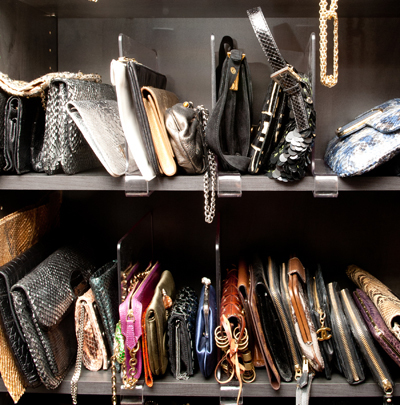 Give your clutches a leg up with shelf dividers. 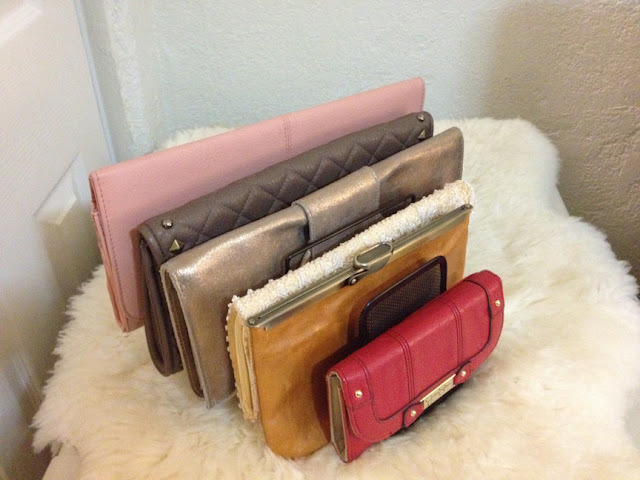 You can position these wherever you'd like on the shelf, and situate just the right amount of clutches between each. Option 2.5 If you like the idea of shelf dividers but require a bit more personal style, you might as well pretend your clutches are really short novels and throw some actual bookends on either side of your collection. Option 3. 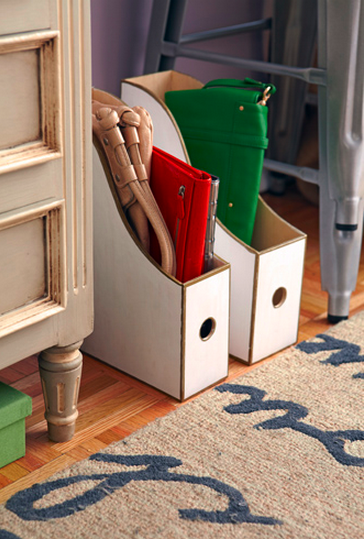 Very possibly the most frugal choice (not to mention brilliant)-- skip on over to your local office supplies store and pick yourself up a mail organizer. Each clutch gets its own slot. Boom! 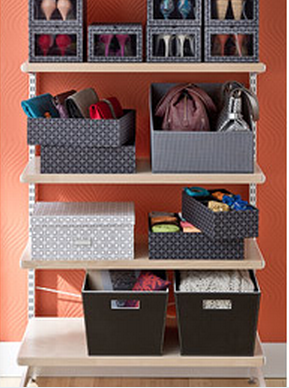 Boxes can also serve as excellent storage. Stand clutches up inside your box so that half of your handbag is peeking out and you'll ensure they stay organized and easy to reach. Keep the lid off permanently so that your clutches are always visible, or opt to lid your box as a way to protect the contents from dust and cookie crumbs. What? Lidded boxes should be labeled, however, with a description or picture of the treasure that lies within. 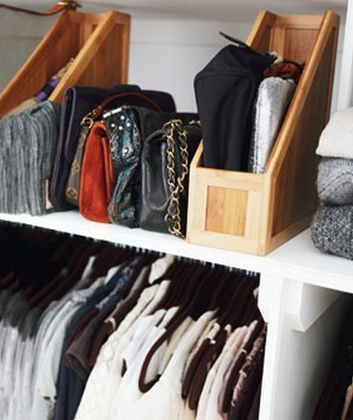 I hope these 4 options for clutch storage will prove useful for you. If you have a creative storage solution for clutches I'm sure we'd all be keen to hear, so share away. And If I've piqued your organizational interest, please do stop by my site, www.livesimplybyannie.com, for further insights. Thank you, Mademoiselle Rachel, for having me! Love the bookend idea! Great post, Annie! Love the magazine file idea and I will definitely give it a try! 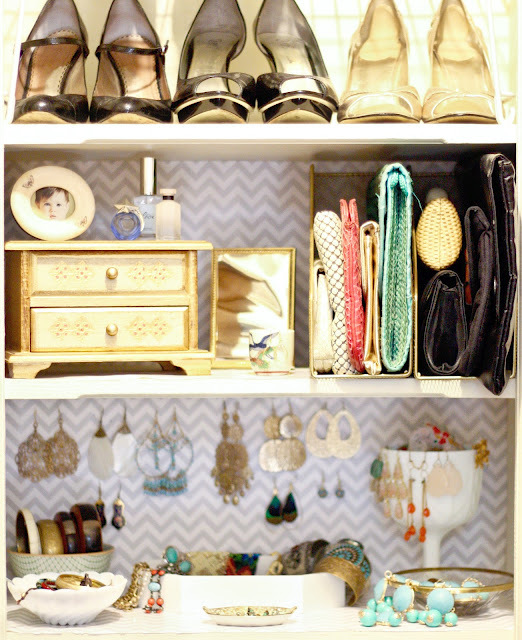 jumped over from Live Simply and love the magazine holder idea...anything to organize the closet more I will try do. Agree with everyone so far, the bookend is genius! I love the idea of book ending clutches, great inspiration! This is ingenious. I will be sure to pick up a set of "bookend" magazine files when I go to Ikea next. Ikea always has cute patterns and textures. I am really inspired by your blog! Your newest follower. I like the helpful info you provide to your articles. I’ll bookmark your blog and check again here regularly. I am rather certain I’ll be informed many new stuff right here! Good luck for the next! Nice post.. I like your Idea for magazine holder idea..
Just discovered your blog and I love this idea. I have a ton of wristlets just in a bag and now you've given some great ideas on how to organize them.